Went fishing off the rocks at 5.30 this morning, thawed out a herring and stuck it on a set of 3/0 gangs and heaved it out. Waited about 3 minutes and started to retrieve the line. Got a solid hook up and the fish stripped off 20 metres of line. It was a good tussle, me trying to keep fish off the oysters and fish trying to get away from me. As it was the first of the run-in tide, I was standing about 2 metres above the water and after a good 10 miutes of to and fro, I managed to climb down to get it to within an inch of me. Almost slipped in and a wave lifted the barra enought for me to hold its jaw. Landed it and measured it then packed up and took it home. Shortest barra session I have had. got home at 6.50 AM. They farm them for restaurants in the UK, we could do with a few escapees to start breeding in the wild. Absolutely no comparison in the taste. Farmed barra taste quite muddy, same with freshwater barra. Was talking to a group of fishos yesterday regards saltwater barra being far stronger and far better table fare than freshies and farmed fish. well done to you. I would like to join you for a feast as I haven't tried barra, yet. Save your money for a trip to The Northern Territory and experience the thrill of barra fishing at its best. The "run-off" is renown for cricket score captures. Run -off? late March through to early May, depending on how big the wet is. In north Queensland, the local fishos lobbied the Qld Govt. to have a few net free zones established, The Govt. decided to put 3 zones in place, Cairns, Mackay and Rockhampton in May last year. 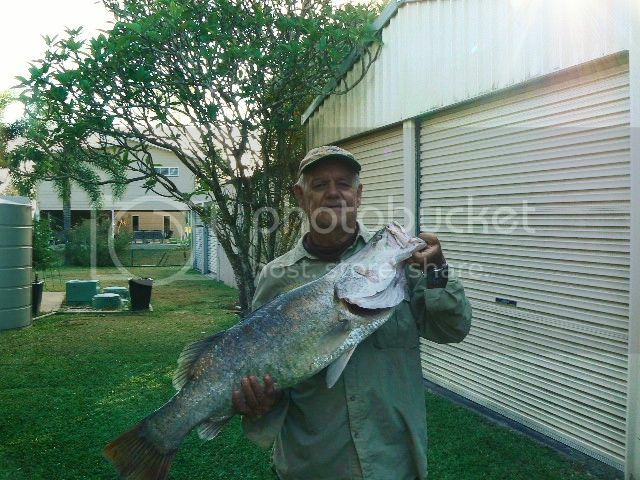 The fishos are reporting increased catches and sizes, Indeed, In 16 years fishing off the rocks, I have caught 4 barramundi and in the last 2 weeks, have caught 5 barra and lost another 3. No doubt true but as we only get the choice of farmed barramundi or cod we don't get to taste the difference. Might pay to soak the fillet(s) in lightly salted water for a few minutes before cooking them. Or...Come to Australia and experience the thrill of catching them as well. Nothing like Barra you have caught yourself ! Two of our best trips anywhere were those tto Cape York, and a couple of years later to the Ord River. Anywhere on the Aussie coast is good fishing (not necessarily for barra though) , but those two were exceptional - barra and much much more. Edited by Vagabond, 05 December 2016 - 11:20 PM.